Now that your Viva is finished and you have completed all of the corrections to your Thesis, you need to have it professionally printed and bound. Here at Chester Bookbinders we make this as stress-free and as straight-forward as possible for you. 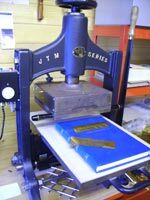 Ours is the ONLY on-line Thesis service in the UK to offer you an ALL INCLUSIVE price on both binding and gold lettering. We carry out all gold lettering by hand using a traditional press. • Gold Lettering along the spine and on the front cover. The option of italic lettering for no extra cost. • Strong five point double stitching with waxed bookbinding thread. • Free ribbon markers in every volume. • Free decorative headbands in the top and the bottom of the spine. • The option to have CD pockets inside the back cover. • Submit a PDF via email for a free, no-obligation on-line quotation. • Thesis and dissertation printing and binding service for both within and outside of the UK. Our products are produced to the highest possible standards, using full colour Xerox High Resolution laser printers. We only us the best quality 100gsm papers, and can produce single or double sided sheets. We are the only company who can offer all of this at a competitive price with a three day turnaround. Take a look at our current Price List and view our Step by Step guide to see how easy it is to get started. For any queries or to discuss special requests, email us at chesterbookbinders@hotmail.co.uk or call our friendly, knowledgeable staff on 01244 547116. Unlike many companies on the internet, we are not a printing or packaging company that does a bit of thesis or dissertation binding on the side. We are a specialist workshop and we guarantee all of our products. We are confident that you will not find better quality at a better price in the UK. At ‘Chester Book Binders’ all we do is print and bind theses. We are committed to giving you the best service and quality available.